Preserving water resources at Crater Lake National Park in a time of dry air, dehydration and dry eye. As a show about the Power of Water, The Sharon Kleyne Hour on World Talk Radio, is concerned with water resources and conservation at our national parks. The more we discover about the behavior and movement of water at places like Crater Lake National Park, the better we can understand important health issues such as dry air, dehydration diseases and dry eye. John Salinas is a "limnologist" who studies lakes and fresh water. He was involved in water resources studies at Crater Lake National Park in the 1980's using a mini-submarine. Although water temperature at Crater Lake's surface can reach 64 degrees, the water temperature at the bottom remains steady at 34 degrees, except near thermal springs. The deep blue is due to the water's depth and clarity, which absorbs all colors except the deepest blue. Near shore, it also does not absorb green. The Power of Water coming and going. 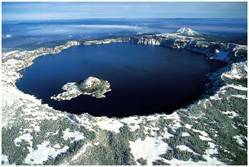 95% of Crater Lake's incoming water comes from rain and 5% comes from runoff down the sides. No major streams feed into or out of Crater Lake. Incoming water is balanced by an approximately equal water loss. 60% is lost to evaporation and 40% is lost to seepage into the rocks and water table. It is necessary to limit direct human contact with Crater Lake because human activities can pollute the water resources and cause algae blooms, diminishing the lake's beauty and adding to the global epidemic of pollution, dehydration, dry air and dry eye.